In case you forgot, CMJ 2010 is just around the corner (Oct 19-23), and just like last year and the year before I’ve decided to put together a gallery of flyers for official CMJ showcases and day parties. This year I’ve opted for Facebook over Flickr, you can view the results so far over here. I’m trying to make it comprehensive, so if you’ve got something to add, or would like your flyer removed, please send me an email. 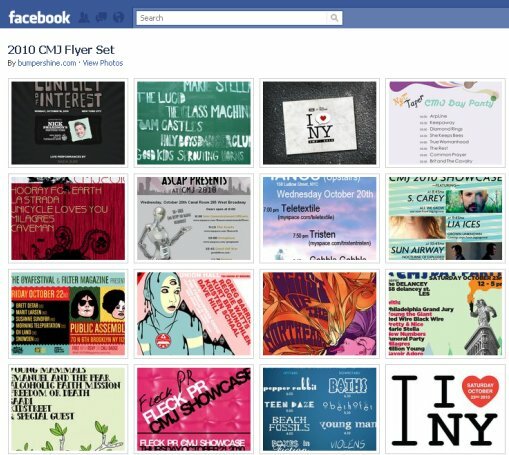 Please don’t forget to “Like” the photo album or my fan page on Facebook, and I’ll see you at CMJ! Check out the CMJ 2010 full schedule over here.